After the huge success of their previous 3 music videos, Mi Casa will be releasing their much-anticipated fourth video for their latest radio single, Can’t Get Enough, directed by the well-respected Tristan Holmes from Star Productions. The video was shot in just over 20 hours and oozes sexiness in its black and white form. The video tells the story of a relationship between a guy (J’Something) and a girl (Model Jennifer Pietersen) – although it’s not your typical boy meets girl scenario. Instead she is completely frozen in ice, a metaphor for the emotional and physical walls she has created around herself. Our romantic hero is able to melt the barriers she has created against him through his unrelenting love for her and through his music. As the ice melts he is able to free her from the ice enabling love to conquer all. The single Can’t Get Enough is only available on the recently released THE PLATINUM EDITION version of the groups much acclaimed 2011 debut album, put together personally by the band in order to ‘give something back to the fans’. The PLATINUM EDITION boasts the full original album with three bonus tracks – acoustic versions of “Heavenly Sent’ and ‘I’ll Be There For You’ and a brand new track, ‘Can’t Get Enough’, already riding the airwaves around the country. There is also a full bonus disc of remixes by producers such as Charles Webster, Atjazz, Gregor Salto, Royal K, QB Smith, Dr Duda and Chymamusique as well as celebrated videos from ‘These Streets’, ‘Heavenly Sent’ and ‘La Vida’. 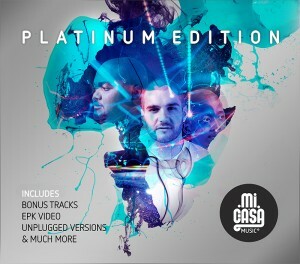 This has been a great year for MiCasa after bagging three SAMAs and having just released their Platinum Edition album, the band has spent the better part of 2012 touring both local and internationally, playing up to 12 gigs on some weeks and working the Mi Casa brand into what it is today – a well oiled machine. The music video for Can’t Get Enough will be launched on MTV Base: Spanking New O’Clock on Friday 14 December at 16h00.